Intense staining with alpha methylacyl-CoA racemase (AMACR) along the apical portion of the cells supports the diagnosis of prostatic adenocarcinoma. Immunohistochemistry with basal cell markers (HMWCK, p63) and racemase can be immensely helpful in confirming the diagnosis of adenocarcinoma in small atypical foci. 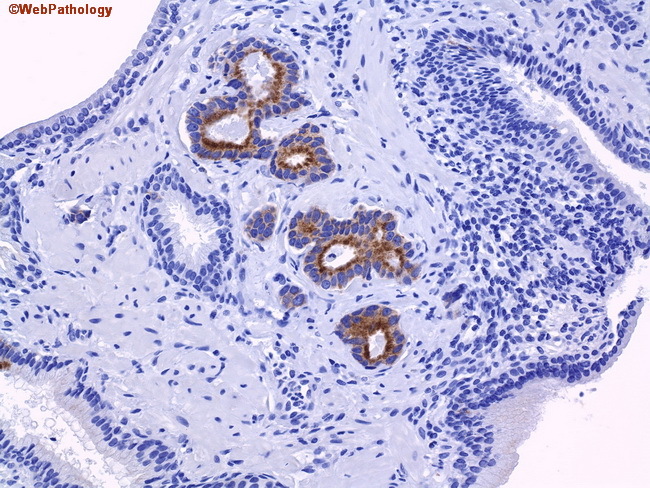 For additional details on the role of these stains in prostate cancer diagnosis, please go to the section on Immunohistochemistry.